SoundCloud can be accessed from Command Line Interface without loading the GUI on browser using an excellent client named soundcloud2000. Here is the how tos. Every advanced user loves CLI over GUI. Indeed, we have demonstrated many Command Line usages which are less known or even not known – Facebook from CLI, Twitter from CLI, Google Search from CLI, full CLI based web browsing. Yes technically the last one – full CLI based web browsing can do the work too, but SoundCloud is towards an web application rather than a website. This Article Has Been Shared 5596 Times! 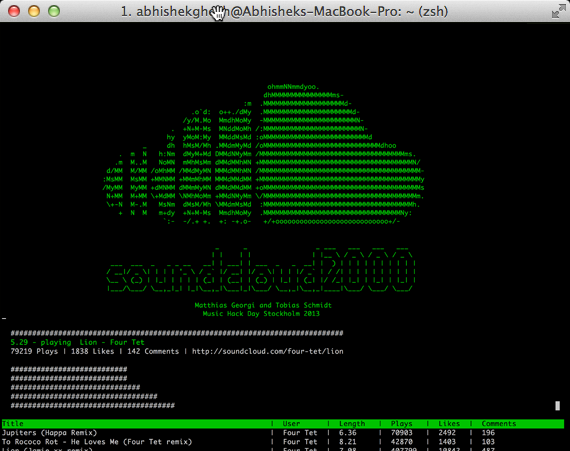 Cite this article as: Abhishek Ghosh, "SoundCloud From Command Line Interface," in The Customize Windows, December 22, 2013, April 21, 2019, https://thecustomizewindows.com/2013/12/soundcloud-from-command-line-interface/.